Renate Ferro, Cornell University, Visiting Assistant Professo gave a collaborative leccture with Timothy Murray, Cornell University, Curator ofThe Rose Goldsen Archive for New Media Art , at The Digital Arts and Culture Conference 09. Their talk "Tinkering With The Archive: Pathways to Conceptual Thought and Digital Practice," was featured during a special panel entitled, Interdisciplinary Pedagody. The panel organized by Cynthis Beth Rubin" showcasse interdisciplinary and hybrid solutions and provokes a sustainable dialogue on contemporary eduactional issues" in the field of Digital Arts and Culture. Ferro and Murray have collaborated on other projects including being the managing moderators for the international listserve, -empyre soft-skinned space. In this presentation they highlighted The Tinker Factory and the Rose Goldson Archive for New Mediaas models for contemporary pedagogy and collaboration. The premiere lecture and workshop of the Tinker Factory funded by The Cornell Council for the Arts and The Rose Goldsen Archive for New Media at Cornell Univesity hosted guest artist Kevin Hamilton. Hamilton is an artist and researcher whose work centers on interactive artworks, methodologies of interdisciplinary collaboration, and manifestations of absence in contemporary and historical telecommunication technologies. 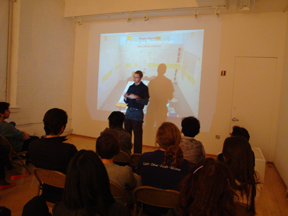 Hamilton's lecture and workshop on October 22, 2009 in Tjaden Hall, "Sited Sound, interaction Design, Collaboration Techniques", hosted undergraduate, graduate and faculty from art, music and technology. Hamilton stated, "The creation of rich interactive experiences typically requires technological virtuosity. Since few of us are able to master ALL the tech we might use, we need to learn ways of collaborating with others who DO have the knowledge. We also need to iterate ideas as far as possible without knowing the exact technology required. " His presentation introduced some methods of collaboration, evaluation, and design to facilitate these processes. Working in small groups students developed realized, embodied sketches for interactive sound installations, borrowing sketching and collaboration techniques from the design group Proboscis and also from the discipline of Human-Computer-Interaction. Hamilton is an Associate Professor at the University of Illinois.